Welcome to the K-Beauty Giveaway Blog Hop! We are a group of bloggers joined together to bring you some of our favorite items found on our ever-growing Asian skincare journey. I hope you enjoy the giveaway I've put together for you in this post, and will visit the additional blogs found in the linky below. A cute Asian take-out style box filled with 7 modeling powder cups. Each cup is a different type of modeling pack that might moisturize, control oil, or just calm your face. You add roughly 3 tablespoons of water to the cup, mix it up with the spatula inside, then apply it to your face and neck with the spatula. You let it harden to a rubbery finish, then peel off and toss in the trash. Your skin will be soft, moisturized, and refreshed. This is a mask packet from the Bubble Pop Cosmetics box that I love. You apply it to your face and let it bubble up for 3 minutes, then rinse. It moisturizes and brightens your skin. This is a sheet mask for your neck designed to smooth out lines. I received two in the My Mask Box and purchased more after I used the first one. You apply it to your neck, and lay down while it works it's magic for 15-20 minutes, and it smooths out lines and wrinkles. It's also very hydrating. This is another love of mine from the Bubble Pop Cosmetics box, but this is more of a rinse than a mask. You fill your basin with 5ml of water (I just filled mine half-way) and add envelope A. Swirl the water a bit then add envelope B and mix until dissolved. The water will carbonate, and you dip your face into the water repeatedly for 3-5 minutes. It sounds tedious, but it's like magic for your pores. These are actually not from Memebox, but recommended by another blogger in this hop, Fanserviced-B. She put together an amazing post comparing several blemish spot patches, and these were a good choice. I love them! This is a sample I received from a generous gal in a package I received, and after I tried the first one, I had to purchase the full size. This is a nice soothing, hydrating, honey based mask that is great for any skin type. Just smooth it on and rest for 10-20 minutes, and rinse off. These are another item from the My Mask Box that are amazing for lines and wrinkles, but these are for under the eyes. They brighten the undereye area as well as smooth it out after 30 minutes. You can also leave these on overnight if you wish. These are becoming one of my favorite sheet masks. They are cooling, soothing, acne-reducing, and just plain packed full of goodness for your skin. I tried a similar product from this line a while back and loved how moisturizing (without exacerbating my oiliness) it was. This particular mask came in my Miracle Masks box and I think it is the perfect quick mask pack for this time of year. Spread it on, let it soak in for 10 minutes, then rinse. These also came in my Miracle Masks box, but I tried the orange variety from my Mask Box #4 and they were soothing and brightening. These cucumber ones are supposed to add moisture and be extra soothing for sensitive eyes. Keep in the fridge for extra puffy-eye-reduction. This, my k-beauty friends, is my current favorite sheet mask. It's a hydro-gel mask that moisturizes any skin type and leaves your skin feeling pretty much perfect after use. I wrote up a whole review here on my blog if you're interested in learning more. I apply the mask and rest for about 20-30 minutes, then remove the two pieces. These are all items I hope anyone with any skin type would enjoy, and now is your chance to win them! This giveaway is open worldwide, but please note that if the winner is outside the US, the prize will not ship until January 28th - I am not responsible for prize delivery! This giveaway is open through January 12th @ 11:59 pm cst, and you may enter using the the Giveaway Tools form below. Disclaimer: The Glitter Chic blog purchased the product(s) mentioned in this post for the purpose of review and evaluation. No monetary compensation was received for this post. This blog contains affiliate links. The Glitter Chic is not responsible for prize delivery. I think I'd like the Ettang Modeling Take-Out Cup Pack, the most! I've seen a lot of peeps on Meme Addicts talk about this and I just haven't had the chance to try it out! Looks fun! Oh I would like to try mask modeling cup!!! I heard a lot of good words about it. The Loveheart sparkling powder was one of the first K-Beauty things I looked up and I never got one so I'm most interested in trying that!!! I would love to try the mememask! I love masks so much!!! As I already have one from the Ettang modeling cups, I would like to try the others. All the masks look super exciting! The Ettang modeling take out cup pack sounds so darn cute! I'd love to try the Take-out cup pack! They look so cute! The A'Pieu NonCo Tea Tree Spot Patches looks most exciting because I love tea tree! Thanks so much for holding this giveaway! I'm excited about the ettang modeling packs as well! I've heard a lot of good things about them. The most interesting thing in this giveaway to me would have to be the benton mask pack, I've heard many great things about benton's products! I'm curious about the Meme mask! I read some reviews for it and it seems pretty good! Ahh I love masks! Thanks for a great blog and giveaway! the modeling take-out cup pack is something I have been eyeing on the Memebox site for a while! I think the Brilliant LoveHeart Sparkling Powder envelope set looks very interesting. It reminds me of the Blithe patting water that I still haven't tried! I would love to try Benton snail bee, sounds good to me.. The love heart sparkling powder and a whole bunch of things.. Actually everything.. Have read a lot of reviews about these products m also that your recommending these m sure they ll be great ! I am interested in all of these masks! I have just recently gotten into make-up and skin care, to be honest, and all of these sound different as well as fun, especially the Ettang Modeling Masks. 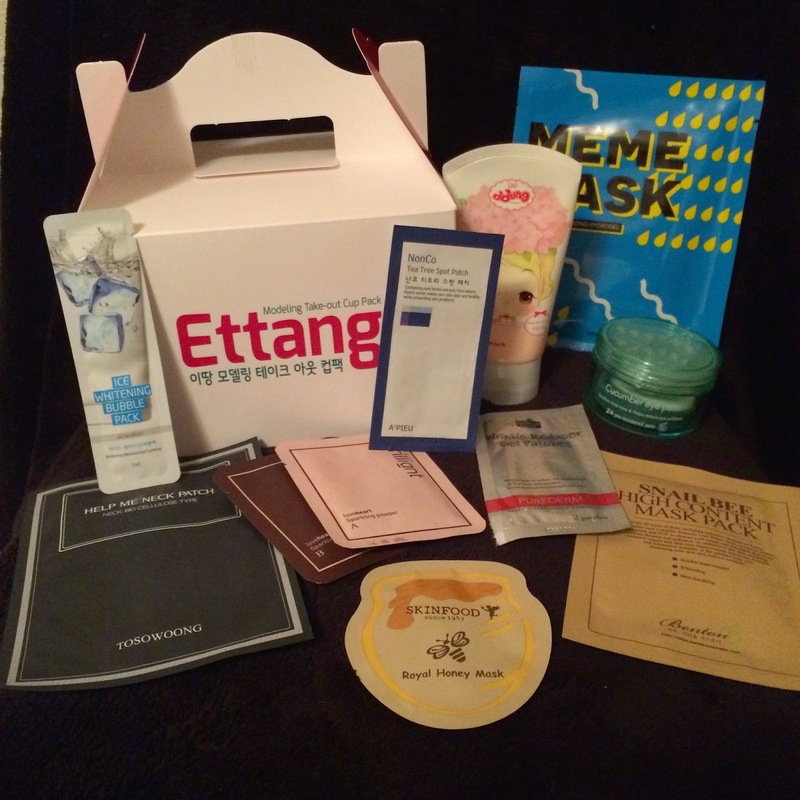 I really want to try the Ettang Model Mask....I'm addicted to masks and this one looks so interesting and fun to use! The Mememask is most intriguing to me, I've heard GREAT things!! I would love the Cucumber Eye Pads!!! I woulb be very curios to try Ettang Modeling Take-Out Cup Pack. Sounds really great. I would love to try the whitening bubble pack and the Meme mask. . .!! They sound really interesting !! I'm very interested to try and get my hands on that Ettang modeling cup. I really think its cute and would love to see if my skin would love it as much as my eyes do. Maybe the Ettang Modeling Take-Out Cup Pack that I've heard of it but never used it. I'm most curious about three of the masks in this giveaway - the Benton, the Skinfood royal honey mask and the hydroel meme-mask. Would love to try the Skinfood Royal Honey Mask. Thank you for the opportunity! I would love to try the A'Pieu NonCo Tea Tree Spot Patches! After reading Tracy's review of the different brands a while back I added them to my wishlist and have been meaning to give them a go when I get my monthly outbreak! Thank you for the giveaway opportunity. It would be fun to try so many different masks, meme, skinfood and bubbles! The Bubble Pack looks most interesting to me since I've not seen that product or used one of those before. Thanks for running this great giveaway. I'd love to try the Sparkling Powder.